Geologists have a saying: "Whatever cannot be farmed, must be mined." Few regions demonstrate this better than Western North Carolina. From the Native Americans who first uncovered minerals and gems thousands of years ago to the miners who today excavate materials crucial to the Silicon Age, mining has profoundly shaped the technology, environment, culture, and community of the High Country. The exhibition is guest curated by the following graduate students of Dr. Andrea Burns at Appalachian State University: Kathryn Burke, Jessica Cottle, Caitlin Finlayson, Jackson Osborne, Bonnie Roane, Carson Sailor, Colby Stevens, Jimmie Vaughn, and Nicholas White. 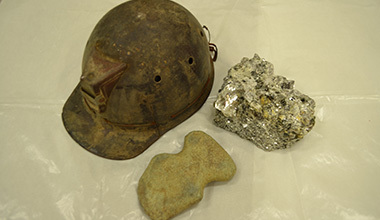 Photo Credit: Collection of the North Carolina Mining Museum at Emerald Village, Little Switzerland, NC.